Was the western intervention in Libya primarily driven by oil? The answer depends on who you ask, but as usual, in the volatile mix of international politics, oil is never far from the surface. It certainly helps the case of those countries that are vying for a piece of the Libyan oil pie that they were involved in the fight against Gaddafi. In that sense it is slightly embarrassing for Britain, to say the least, to have to face accusations that they were involved in aiding rendition flights to Libya and that they were sharing close intelligence with the Gaddafi regime. But, embarrassing revelations aside, as the war enters its final phase, the race is on for Libya’s oil, with Britain, France and Italy all staking a claim. Although the National Transitional Council (NTC) is saying that nothing firm has been promised, it certainly helps if you backed the rebels. 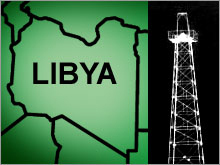 Many of the oil majors are circling the corpse of the Gaddafi regime even though they were working with it until recently. Indeed the rebel leaders have said that countries such as Britain and France that supported the uprising should expect to be treated favourably. Nor should Italy be overlooked. Before the war, the Italian company ENI had the most dominant position, producing 273,000 barrels of oil a day. ENI also operates a gas pipeline from Libya to Sicily. The Italian Foreign Minister Franco Frattini has even gone as far as saying that the Italian oil company Eni “will have a No. 1 role in the future” in Libya. Indeed last week it emerged in the French press of a supposed deal from early April which purported to show an undertaking by the NTC to reserve “35% of total crude oil in exchange for the total and permanent support for our council”. Indeed the French oil company Total, was actually becoming more active in the country before the war broke out. Its al-Jurf field has been untouched by war as it’s in the Mediterranean. BP – which had already promised to spend $1 billion on exploration with Gaddafi – is also said to have held talks with the transitional government. Shell too had been involved and would also be looking to be rewarded. Already some of the murky deals of the war are being exposed. One oil firm whose chief executive has bankrolled the ruling Conservative party in Britain won the exclusive rights to trade with Libyan rebels during the conflict, following secret talks involving the British Government. The $1 billion deal was with oil trading company Vitol which is close to Alan Duncan, the former oil trader turned junior minister in the coalition government. Ian Taylor, Vitol’s chief executive and a friend of Mr Duncan, has given more than £200,000 to the Conservatives. That’s what friends are for in the toxic mix of politics and oil.